The Regalo 192-Inch Super Wide Gate and Play Yard is large enough to be configured around nearly any fireplace. 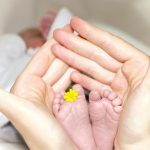 The fireplace and hearth areas are some of the most dangerous in your home for little ones. 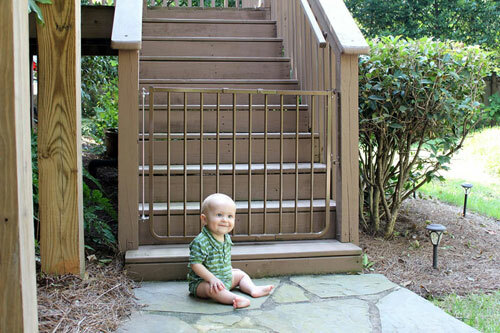 Finding a good fireplace baby gate can provide an invaluable safety barrier, and also provide parents with peace of mind. 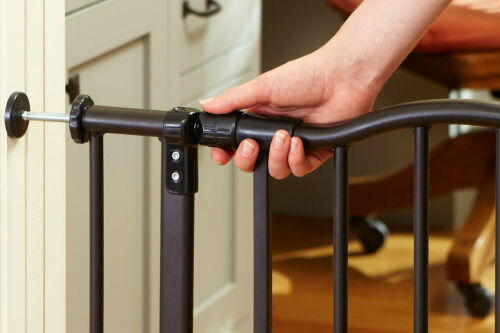 When looking for a baby gate to guard your fireplace, look for models that are hardware mounted. 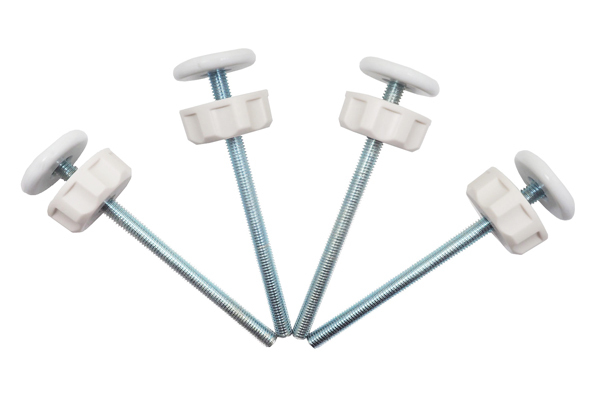 Hardware mounted models are the only types of gates that can provide the strength and stability to guard such a high-risk area. 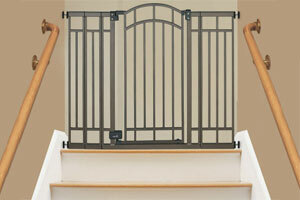 You will also need a configurable gate to be able to shape the gate as needed around your fireplace. 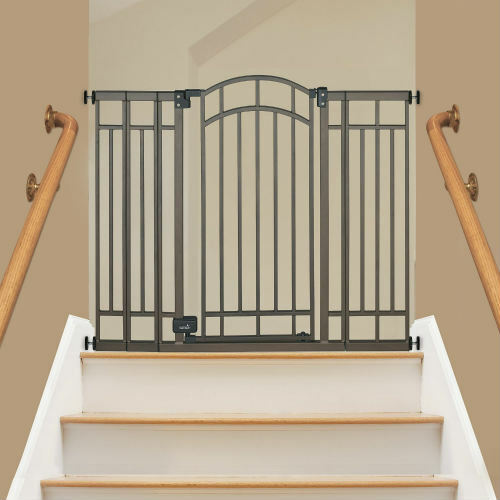 For most people, the width of the gate will be important since it will need to be wide enough to stretch around the fireplace and be attached to adjacent walls. 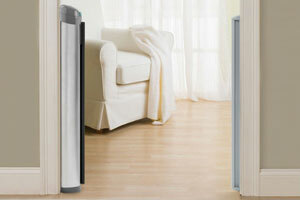 Below you’ll find comparisons of highly-rated configurable models that can be used as fireplace baby gates. Hopefully the comparison chart above is useful in getting a quick sense of the variety of configurable fireplace baby gates that are available at different price ranges. Below we’ll go over a few of our favorite models and go into more detail about what makes them popular choices. The Regalo 192-Inch Super Wide Gate and Play Yard is large enough to fit around nearly any hearth area, and it stands at 28 inches tall. It is also offers custom configuration as it is composed of 8 folding, detachable 24-inch wide panels. 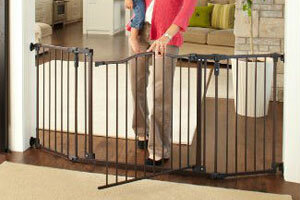 This means the gate can be shaped to fit around your fireplace as you see best. 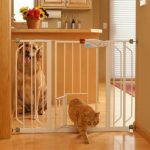 Another positive feature of this gate for use around the fireplace is it includes a panel with an easy-open door with a safety locking feature. This means that adults can simply walk through the door to access the fireplace instead of having to step over the gate or move it. 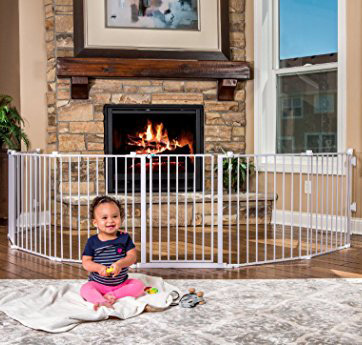 This extra wide baby gate comes with hardware so it can be mounted to walls, perfect for securing a gate to block off the fireplace. The gate is made of steel to further ensure its sturdiness. The North States Superyard 3 In 1 Arched Decor Metal blends function and style. This gate is composed of six configurable panels that can span up to 144 inches. It stands slightly taller than the average baby gate at 30 inches high. 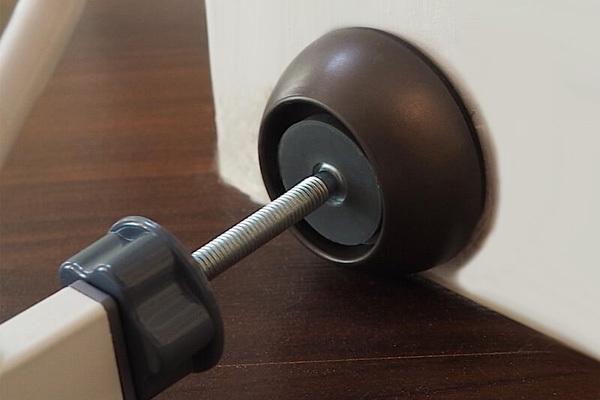 It is made of heavy-duty steel, and it comes with mounting hardware so you can securely attach the gate to your walls. 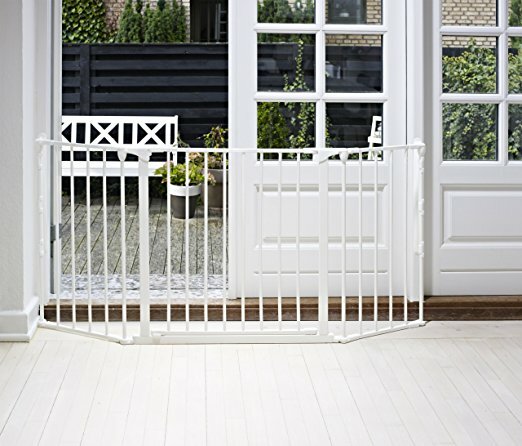 Like the Regalo model above, this gate includes a panel with a door. The door is self-closing and has a child-proof double-locking system. The door panel also has a little extra flair with an arched top. Speaking more to the style of the gate, it is finished in an elegant matte bronze. 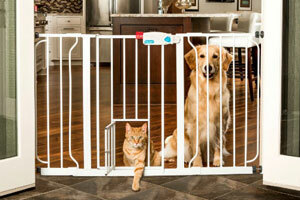 The style features along with the gate’s functionality make it the highest-priced option on our list. 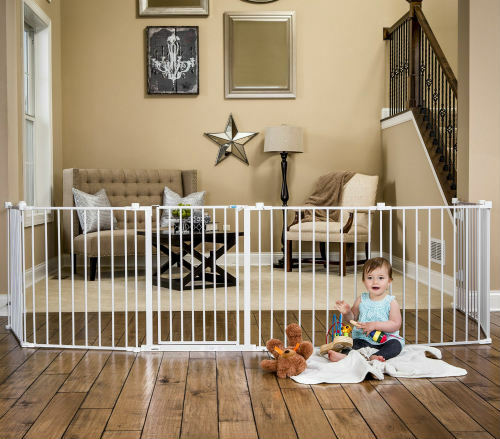 The Baby Dan Flex Safety Gate is not quite as customizable as the other two featured models, but it comes at a lower price point. The price is slightly surprising considering the gates are made in Denmark. This gate is made up of three panels — a 28-inch door panel and two 13-inch side panels — giving the gate a total span of 54 inches. 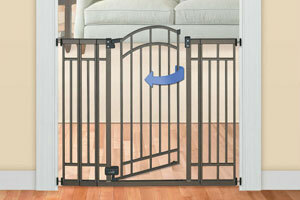 It stands a little shorter than the average baby gate at 27 inches. 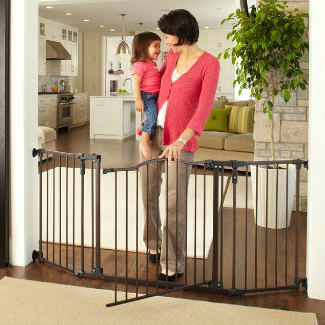 Do to the shorter width and to only having 3 panels, this gate is far less flexible than some other configurable gates. However, if the width works for your fireplace and you’re looking for a solid budget option this gate could be a good fit.